It is an unassuming weed that grows in profusion along the roads and along the southern stretch of the Ganga. Its berries are black and lacklustre. One wouldn’t think phutka, as the plant is referred to in Bhagalpur, Bihar, could amount to anything much. So I was surprised to find sabjiwalis collecting it from my kitchen garden in Bhagalpur. The tender twigs earn them Rs 10-15 a kilogram in the market, they told me. I was intrigued. Where I grew up in Patna it was ignored as a weed. Conversations with my colleagues at T M Bhagalpur University helped shed some light on the humble phutka. As a botanist, I knew it as Solanum nigrum, a herb related to the familiar potato. But soon I discovered that phutka was indeed quite a culinary favourite. Popularly known elsewhere in India as makoi, phutka is available from January until its fruiting season during March and April. The leaves or saag cooked with oil and salt along with rice make a simple meal. Mixed saag, which has the green leaves of spinach, chaulai and bathua, along with phutka, is very popular in the floodplains of Bhagalpur. The popularity of phutka is not restricted to our country. In Ghana, the unripe green berries are used in soups and stews. In South Africa, the very ripe berries are hand-picked and made into a runny purple jam. In Greece and Turkey the leaves are called istinfo and used in a salad known as “horta”. In Indonesia the fruit and leaves are eaten as part of a traditional salad called “lalapan”. The plant with such an impressive culinary versatility is known to be potentially poisonous. All parts of it contain toxic glycoalkaloids, including solamargine, solasonine and solanine. The toxins are most concentrated in the unripe green berries. In large doses, it can cause serious ill-effects, but is usually not fatal. The ripe berries, however, can be eaten safely. 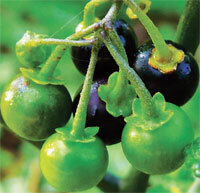 According to The Wealth of India, published by the Council of Scientific and Industrial Research, leaves of Solanum nigrum are a rich source of vitamins, particularly vitamin C. The ripe berries contain glucose and fructose and are used as a domestic remedy for fever, diarrhoea, ulcers and eye troubles. The seeds, too, when rubbed on the skin, are said to aid in removing freckles. The medicinal benefits of phutka are well known among the people of Bhagalpur. Shalkhi Devi, a vegetable seller in Bhagalpur, says the ripe black berries are used to cure constipation and jaundice, and are even said to enhance milk production in a lactating women. Jaiprakash Singh, a peon at my university, told me that fresh extract of the tender twig is used to treat jaundice in his village Sonbarsa in Bhagalpur. The benefits aside, I am looking forward to a homely winter meal with phutka from my very own kitchen garden. Wash and cut phutka leaves. Cut ginger and chilli into small pieces and mix thoroughly with the remaining ingredients. Add salt and water as required. Make into small round balls and fry in mustard oil. Serve hot. 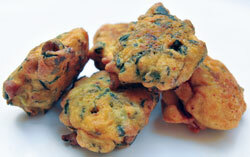 Wash and cut leaves and chilli into small pieces and add to wheat flour. Add salt and mix well. Knead with water till the dough is smooth and pliable. Roll the dough into round chapattis. Put the chapatti on a tava and roast both sides. Add mustard oil on the roasted bread. Serve with chilli pickle. Hey! this was an interesting read but I am a little confused here. Does this mean thats it's poisonous and we can still eat it as part of regular meals? In South India, this a staple green eaten by every class of the society. It is well known for curing ulcers of the mouth and stomachs so much so that people apply the juice from its leaves when they get a cut on their skin or on a fresh wound. In Tamil, we this is called Mani Thakkali (berry tomato) or Sukkutti. It will be nice if the author had explored how it is used in rest of India along with its usage in other far-off countries. That was a very interesting article about the plant phutka found in the southern stretch of the Ganga. I think you have done pretty a research on this topic. I loved the recipes too. Thanks for the effort as well as the post. Keep sharing.